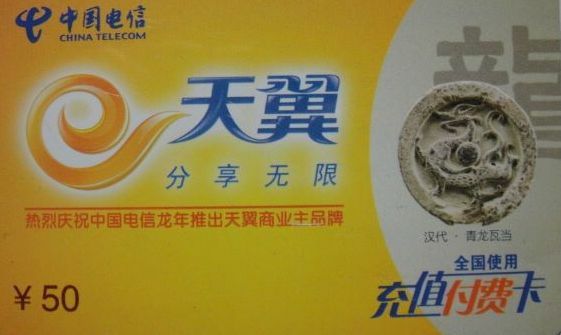 A China SIM Card is the "brain" of the phone. It has a small computer chip embedded into the plastic that stores the cell phone number, settings, messages and other data necessary for the handset to function. The cards also store available call credit information and come with some call credit at the time of purchase. To use, just insert the SIM card "chip" you purchase into your GSM cell phone and you are ready to make and receive cell phone calls abroad. 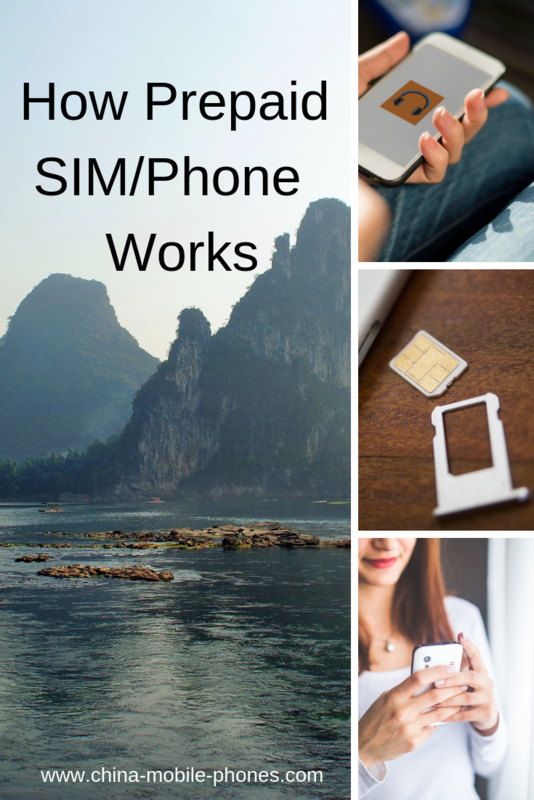 If you already own an unlocked GSM cell phone, you only need to purchase the appropriate SIM card. The SIM "chip" fits into a tray where metal sensors make contact with the gold contact surface on the SIM card. Please note that our SIM cards only work with the FDD-LTE (4G), WCDMA (3G), and GSM (2G) unlocked cell phones. 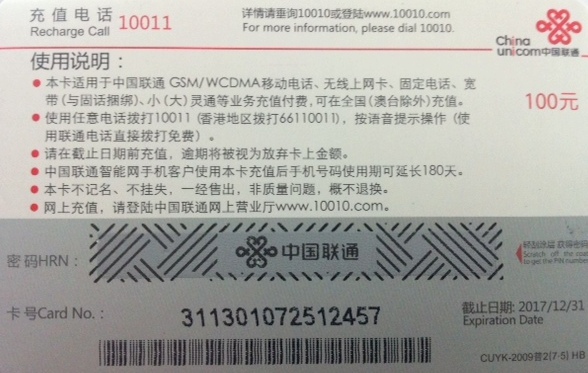 WCDMA has 2100 band that are compatible for using overseas. GSM Phone: A phone which uses the GSM cellular network. Often distinguished by the use of a SIM card which is usually found behind the battery. Triband: A phone which operates on all three GSM networks. 900, 1800 and 1900 MHz. GSM 900/1800: GSM network used outside North America. If you are not sure if your phone is compatible, please send us a message. All the SIM cards we sell work on a pre-paid (also known as pay-as-you-go) system. With pre-paid calling, you are always on top of your phone expenses and there are no heart attacks when you receive your phone bill. Your SIM card will come with a base number of call credits you purchase. When you have used up this credit or whenever you want to add more to the existing amount, you can "recharge" (also known as "reloading" or "topping-up") the SIM card in your phone by purchasing a recharge voucher card at a local convenience outlet such as a magazine stand, 7/11-type store or at the corresponding phone store. These are sold in different denominations. 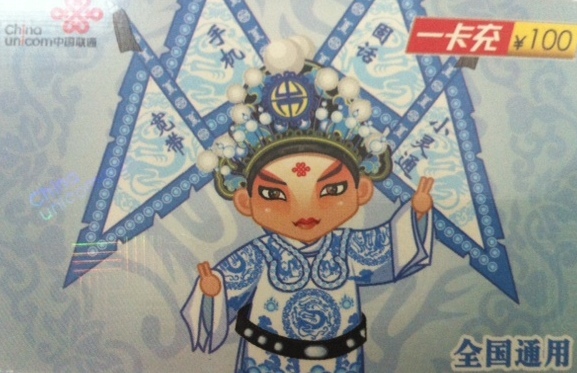 Here is a typical recharge voucher or card in China. This is from the China Mobile Corporate. This is from the China Unicom Corporate. This is from the China Telecom Corporate. A Convenience shop. In China, these sorts of stores sell recharge voucher cards for pre-paid SIM cards. 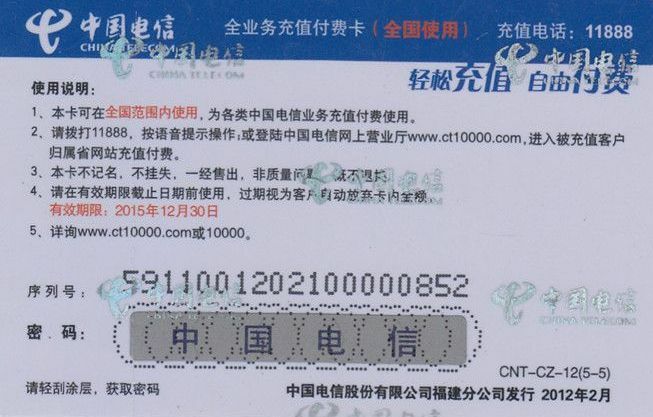 Always make sure to purchase recharge cards from the same carrier(China Mobile) as that providing your phone service. 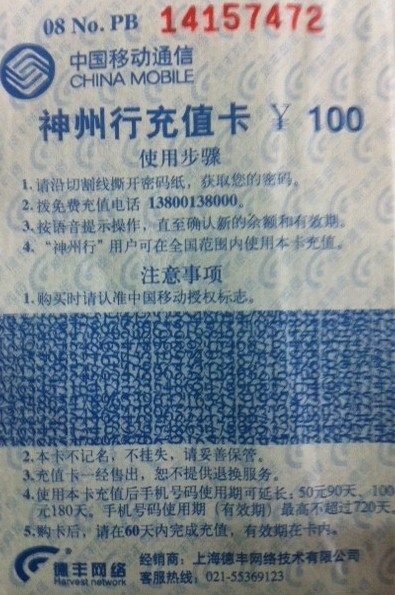 On recharge voucher rear side: you need to scratch the protective to reveal the recharge code. The instructions for this card say to dial 13800138000 and then enter the 18-digit recharge code. By following the voice prompt, the recharged credit and valid date will be confirmed.